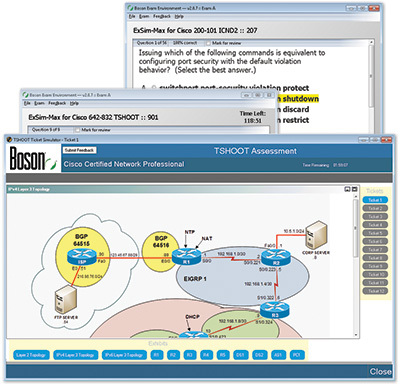 The Boson Exam Environment (BEE) is a delivery system, or testing engine, that delivers many practice exams written by many different authors including Boson Software, Boson Exam Publishing Authors, Cisco Press and McGraw-Hill, among others. The BEE is also used by several corporations to test their employees' knowledge of products and services. Businesses wishing to use the BEE to deliver their testing content may e-mail us at support@boson.com. If you are an author and would like your exam to be delivered by the BEE, visit our Boson Exam Publishing Authors page. Download the BEE from our download page and follow the steps for installation. After the BEE is installed, you may delete the downloaded BosonExamEnvironment-Setup.exe file and launch the BEE. For more detailed information, download the complete BEE User Manual (PDF). Download a previously activated exam. To activate your new exam, select option two (2) and click "Next". This will launch the Activate Exam Wizard. Use the Activate Exam Wizard to activate your exams. The Activate Exam Wizard unlocks your exams for download and registers the exams for use on your computer. The activation key is found on your purchase receipt. If you did not receive a receipt via e-mail, please check your account to view your purchase history. Enter your activation key(s), one key per field, and click "Next". You may enter up to five activation keys at one time. NOTE: The Activate Exam Wizard will register the license to the computer on which you are activating the exam. Activate your exam(s) only on the computer that you will be using when accessing them from the BEE. If you are having difficulty activating your exam, check our BEE FAQ page. If the FAQ page does not help you resolve the issue, contact us at support@boson.com, or submit a support ticket. You can load your practice exam by selecting the exam in the "My Exams" tab. Once the exam is selected, click "Load Exam" in the bottom right corner of the BEE. If no exams are present under the "My Exams" tab, you have not activated any exams or downloaded any demos. To activate an exam, use the "Activate Exam Wizard". Most products delivered by the BEE contain multiple exams to choose from. You can select any of these exams with preset question sets or create your own mixture of questions by customizing the exam. Simulation Mode allows you to simulate the real exam experience. You can take any of the available exams within your product in Simulation Mode, and you can also take a Random Exam in Simulation Mode. Custom exams are not available in Simulation Mode, as they do not simulate the actual exam experience. The timer will start as soon as your exam begins. The duration of the exam is based on the duration of the actual exam experience. 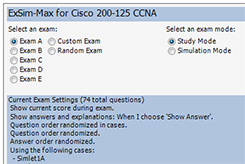 The timer is enabled by default in Simulation Mode and can be enabled in Study Mode by modifying the exam settings after an exam is selected and loaded. Study Mode is an excellent way to learn by using the answer explanations and references included in the product. This allows you to learn as you practice taking the exam. In Study Mode, you can modify the exam experience using the "Modify Settings" options. By modifying the exam, you can target specific topics and keywords to test your knowledge, modify the timing of the exam, modify the "Show Answer" settings and more. To customize an exam, select "Custom Exam", then click "Modify Settings". From this screen, you can toggle options such as randomizing question and answer order, adjusting test duration and showing your current score during the exam. You may also select keywords and categories to include or exclude in your custom exam. To select keyword(s) and categories, click "Category and Keyword Settings" at the bottom right of the BEE. Random Exams pull questions randomly from the entire question pool within the product. You may modify the exam experience by selecting "Modify Settings", allowing you to toggle options such as test duration, enable/disable Smart Mode and show/hide answer explanations. Select "Begin" after choosing the exam and exam mode. The first exam question will appear in the BEE. The timer will appear in the top right corner if you are taking a timed exam. Review the question and select your answer(s). If you are in Simulation Mode, click "Next" to move on to the next question. If you are in Study Mode, you can click "Show Answer" before or after you have made your selection. The correct answer will then be shown, along with a detailed explanation and references. If your answer is correct and you are comfortable with the subject matter, move on to the next question by clicking "Next". If your answer is incorrect, read the explanation and use the references to learn more about the subject. You can mark a question for review while in Simulation Mode or Study Mode by checking the "Mark for review" box at the top of the window next to the question counter. Click the "Question Review" button at the bottom of the window at any point during the exam to see your marked questions. To return to any marked question, select the question in the list and click the "Go to Question" button at the bottom left. This will take you back to the selected question in the exam. Click the "Notes" button at the bottom to type personalized notes about each question. Save your notes by clicking "Save" below the text field. Close the box by clicking "Close", or delete your notes by clicking "Del". NOTE: If you do not save your exam ("File" > "Save"), your notes will not be saved. You can print the current question by clicking the "Print" button at the bottom of the window. Click the "End and Grade" button at any point during the exam to end and grade the exam. Unanswered questions will be marked as incorrect and will affect the overall score. The Score Report provides your Overall Score, Category Breakdown, Question Review and Category Review. The BEE will save all of your test results when you click the "Submit Results" button. Saved results include Date Submitted, Final Grade, Number of Questions Taken, Number of Questions Correct and Number of Questions Incorrect. You can submit feedback to the respective exam authors who deliver their exams via the BEE by clicking "Feedback" in the top menu. Feedback submitted for Boson ExSim-Max questions will be reviewed by our in-house staff authors. Feedback submitted for Marketplace Practice Exams will be automatically forwarded to the author of the product. Feedback submitted for Study Guide CDs (such as those provided with Cisco Press and McGraw-Hill books) will automatically be forwarded to the book's publisher for review. NOTE: Boson's practice exams are called ExSim-Max. These practice exams are NOT included with ANY study guide, book or CD that is included with a book. Boson does partner with book publishers and independent authors to help them deliver their content. However, only products titled ExSim-Max include content that is written, edited and maintained by Boson. Demos are available for every practice exam delivered by the BEE. To get a demo, launch the BEE and select the "Get Demos" tab. Locate the demo in the product list that you would like to download and click "Download Demo". Once the Demo has downloaded, it will be available in the "My Exams" tab. You can purchase a license for the product directly from the BEE by clicking "Buy Now".